3,196 km bicycle travelling started in Tashkent in Uzbekistan, with a quick detour by bus to Samarkand, then by bike to Tajikistan, over mountains and passes on Pamir Highway along the river forming the border to Afghanistan, following Wakhan Valley between Pamir and Hindu Kush Mountains in Pakistan and northwards along the Chinese border climbing several passes to Kyrgyzstan, around Issyk-Kul Lake to the capital Bishkek. 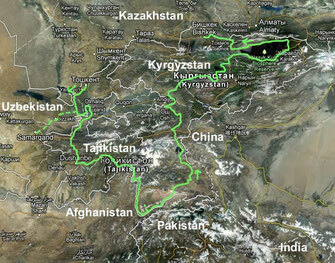 Do you like Cycling Pamir Highway? (10 - 12 July 2012, 3 days, 249 km, 360 metres in altitude) At the airport Düsseldorf I met Fabian from Germany. Together we flew to Riga in Latvia, where we met Raul from Spain. The three of us had arranged to meet in the Radforum on the Internet for this trip. Together we flew to Tashkent, the capital of Uzbekistan, where we arrived in the middle of the night. We assembled our bikes, packed our bags and started cycling at 5.00 in the morning. It got hot, but the road was flat and we had a slight tailwind. Nevertheless, it was quite exhausting due to the lack of sleep and we were all happy when we finally arrived in Guliston after 124 km. After a bit of sleep, we walked through the village for a short while and went for some food before falling back to bed tiredly. The next morning we took a taxi 210 km to Samarkand, the famous Silk Road city, and visited the Registan, one of the most impressive squares in Central Asia, with three large medresas, and other attractions. Then it was 210 km by taxi back to Guliston. The next morning we cycled south to the border with Tajikistan, but annoyingly, not only was the border crossing south of Jangier closed, but also a little further east at Bekobod. So we had no choice but to turn north again and finally drive over the border at Buston. (12 - 31 July 2012, 19 days, 1,486 km, 19,757 metres in altitude) After we finally crossed the Tajikistan border, we took a room in Buston after 140 km. The next morning we went back south and after about 50 km we were back at the border station, where we had been the day before, even if on the other side. From now on it went slowly but steadily uphill. In Istravashan we stopped for lunch before continuing to Sahriston at 1,420m. The next morning we drove off again before 6.00 clock, continue steadily uphill on asphalt up to 2,500 m altitude and then further exhausting and dusty on a bad track to 3,378 m. On an endless jogging track it went downhill forever, after 52 km of the day after almost 25 km finally back on asphalt. We passed Ajni and found 20 km behind the intersection a great campground under apricot trees at 1,600 m altitude. At 4.45 o'clock I crawled out of my sleeping bag and was sick! Everything came up and down, I did not eat and took my emergency antibiotic Tinidazole. After some waiting for the others, we decided to start driving. Very exhausting and exhausted, I struggled up to the Anzob tunnel at about 2,700 m altitude. Since the old pass road led over almost 3,400 m and we knew nothing about the trafficability, but the tunnel partially flooded, lack of lighting was pitch dark and the roadway in the tunnel was a pothole slope of the worst sort with partly meter deep craters, we decided not to go through the tunnel cycle. Fabian caught a car that took him. Raul and I took a truck a short time later. It had been a wise decision. The craters were mostly flooded, parts of the tunnel were completely under water, so that cycling would have been a blind flight through wadentiefes water, with the risk of submerging every second in a crater, one could not even guess before. The trucks tormented themselves at crawl through the pitch-black tunnel, where water came from every corner somewhere. Of course, there was no effective Abgasabsauganlage, so that even the ride in the truck was a rocking ride, the ride on the bike would have been rather a hell of a ride with an uncertain outcome! Escaping the tunnel without damage to the material, we rolled through breathtaking scenery gradually downhill to Dushanbe at 880 m, where I was even better in the evening. I still had not eaten anything, so I tried it with a pizza in the evening. Everything went well and I slept off the next day. Then I walked around the city with Fabian and visited the Shah Mansur Bazaar. The next morning we went on the Pamir Highway and thus slowly up to 1,800 m and back down to 1,100 m and then on a dusty slope again uphill. Between Obigarm and Darband we paid for food and a place to sleep. At night it rained and there was strong wind. On a bad track it went the whole next day up and down. I had some problems with flat hoses because I had not swapped the tires before traveling. Unfortunately, one of them just seemed to come to the end of his life here and make holes in my hoses with his breaking kevlar threads. After Tavildara we went partly through mud and water and then finally uphill again. About 3.252 m it was exhausting on the Sagirdasit Pass and from there through spectacular scenery bumpy and seemingly endless 40 km downhill. In Kalaichum we reached the border with Afghanistan, from where we followed the border river Panj through breathtaking mountain scenery. Two days we continued on the Pamir Highway through spectacular scenery to Khorog at 2,100 m altitude. It was Fabian's birthday, but we were all too tired to celebrate and postponed this to the next, then cycle-free, day. I bought a tire of very poor quality just in case, but was glad to have found one at all and also took some tubes with me. Raul said goodbye to us here. He had located a SUV that would take him back to Dushanbe, from where he would fly back to Madrid. At noon Fabian and I made our way to the Wakhan Valley south of Khorog. We then left the Pamir Highway, which led directly to the east and it went up to 2,450 m and continue through spectacular scenery along the border with Afghanistan, which along this valley only from the river to the peaks of the opposite mountains was enough, behind you could already see the peaks of the Hindu Kush in Pakistan. In Darshai at 2,750m we took a room in a traditionally decorated house and set off with backpacks on a half-day hike on the way to the hanging paths, which actually did not exist anymore. Nevertheless, the path led through magnificent scenery at almost 3,200 m. Partly in drizzle and storm gusts we went back to Darshai, where we were served a great dinner and thanks to a cousin, who spoke English, could also entertain. The next day the asphalt was over after a few kilometers and it went on strenuous Rüttelpiste up and down through beautiful scenery. In Langar it was then only partly sliding steeply uphill to 2,850 m, before we could cycle again and our tent then opened at 3,265 m 8 km behind Langar. The next morning I felt sick again, I took antibiotics and dragged very weak only a few hundred meters by bike, so we stopped at a shepherd's house, where I slept for three hours in a sleeping bag. After that I felt better. But it went on very strenuous up to 3,700 m, where we opened our tent for lack of alternative in whipping wind. I fell into my tent dead tired. The next morning it was exhausting, but with blue sky up to the Hargus Pass at 4,344 m, before it finally went downhill again and we met again on the Pamir Highway and thus on asphalt! One day later, we met Patrick and Viktor, who reported heavy collisions in Khorog shortly after we left the place. The chief of police had been shot, who wanted to do more to counter the drug traffic from Afghanistan, and then there were heavy fighting with tanks and machine guns, curfews and all had locked themselves in the rooms. Only after a few days, the two had left the place and had come over the shorter Pamir Highway here. Together we cycled further northeast. A short time later we met Annemiek from Holland, who courageously cycled alone in this area as a woman. Five of us went on through beautiful scenery to Murghab at 3,600 m, where we went to the Bazaar and walked around a bit. I went to the barber and the next day we drove on. After a while, we parted ways with Patrick, who wanted to slow down and fought the Akbajtal Pass at 4,655m, the highest pass of the trip. At 4,450 m, we set up our tents on a watercourse. I had a headache and I was cold. At night it was only two degrees in the tent, outside it froze below zero degrees. The next morning I felt better and in the best weather we drove over gravel to Karakül at the picturesque Karakül Lake at 3,950 m with breathtaking panoramic views. With very strong headwinds, the next day near the border with China, we went over a first pass and then to the border pass at 4,280 m and again 20 km downhill on a very poor route to the Kyrgyz border post. (31 July - 19 August 2012, 19 days, 1,461 km, 12,784 metres in altitude) After the immigration formalities we fought very hard against gale-force headwind after Sary Tash in the border triangle Kyrgyzstan, China and Tajikistan. Around the city were snow-covered 5,000 and 7,000m peaks. The next morning we said goodbye to Annemiek, who drove on to Kashgar in China. We pedal on good asphalt uphill over a double pass at 3,615 m, then eternal downhill at 1,550 m, back up to 2,406 m and back down to 1,850 m, where we camped 44 km before Osh. In Osh we took a day off, strolled across the Bazaar, wandered around and drank a couple of beers in the evening. In a curve we drove to Jalal-Abad at 750 m and then on asphalt another 50 km to 1,300 m altitude. From then on it went over Rüttelpiste only moderately, later in serpentines up to over 3,000 m and over bumpy slope also downhill to 1,280 m in Kazarman, behind which we spent a second tent night. After some exhausting kilometers, partly without water, we returned to breathtaking views at 2,750 m, where we lost on the way Fabian. In the thunderstorm, Victor and I cycled to Ak-Kyya, where I was bitten twice by the same dog! Unfortunately, I do not catch the mutt and so we drive some streets and camp at a mosque. The ligaments on the lower leg hurt me, otherwise nothing worse seems to have happened. At the intersection near Ak-Tal, we built a clue for Fabian the next day and waited for him there. At noon he finally arrived and the three of them went north towards Song Kul Lake. At 2,250 m, the second and more violent hailstorm stops us directly at an accommodation where we can spend the night in a traditional Kyrgyz yurt. In ten serpentines it went on good track then the next day up to 3,346 m and in an arc south to the well at 3,000 m altitude Song Kul lake around. In the distance only a few yurts were to be seen, breathtaking landscape! It went up again 400 meters and then cold and with a few raindrops downhill to 2,750 m, where we pitched the tent. The next day we finally had asphalt under the tires again! Through some construction sites we went to Issyk-Kul Lake, which we drove with an overnight stay in Kara-Koo on the south bank to Karakol at 1,750 m. There we finally got a hot shower again! We took a day off, strolled around the markets and went to the Chinese mosque and the cathedral. The next morning we said goodbye to Fabian, who wanted to continue from here to Kazakhstan. For two, we went on the north shore of the overall little spectacular lake along on narrow and busy road to Colpon-Ata, where we entered the next day a beach day. West of the lake it went through a narrow canyon against very strong headwind. During the night we had to dismantle our idyllic estimated camp at a reservoir and move, because the reservoir had been further accumulated and was already water in Victor's tent. Nevertheless, we started early the next morning and reached after 100 km the Kyrgyz capital Bishkek. Two days we wandered through the city and across the markets. We drove to the gigantic Dordoy Bazaar, a city of two-storey containers, a maze of markets where, if you did, there really was everything! The next morning I said goodbye to Victor and got into the taxi to the airport. It had been a terrific journey along one of the most spectacular roads in the world and through breathtakingly beautiful landscapes and great companions! But it had also demanded a lot from my body and was anything but a relaxed bike tour. And yet I would still drive the track again!